JACKSON, Miss. 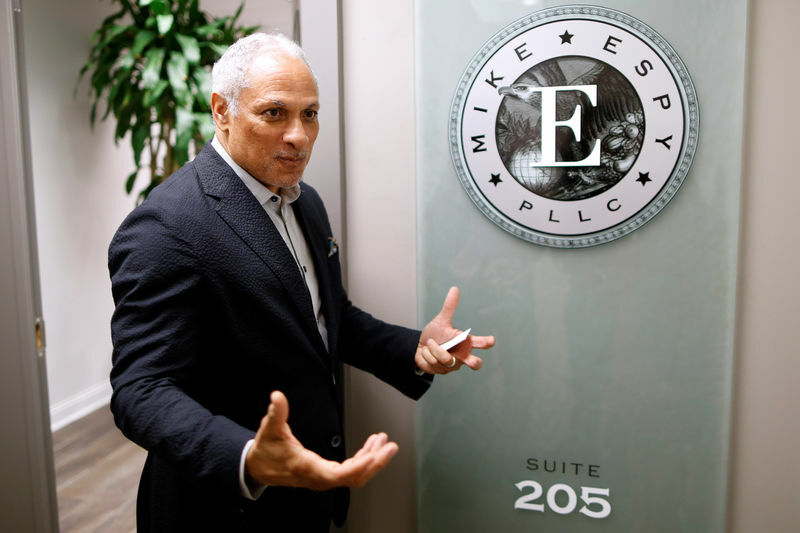 (Reuters) – Walking through his law office in Jackson, Mississippi, Mike Espy shows off a framed award from the National Rifle Association recognizing his pro-gun votes in Congress. Now running for U.S. Senate, Espy calls himself a free-trader, a budget-cutter, a job-creator, a Christian, a friend of the military and an admirer of retired Republican Senator Thad Cochran, whose seat he seeks. One big difference between him and Cochran: Espy is a Democrat. The centrist rhetoric reflects Espy’s challenge in trying to win this conservative stronghold and become the state’s first African-American senator since the late 1800s and its first Democratic senator since 1989. With little chance of converting hard-core Republicans, Espy needs to capture moderate and independent white voters in a state that voted heavily for Donald Trump in 2016 – while at the same time energizing Mississippi’s large and typically liberal African-American vote. “You can’t put me in a box,” said Espy, who highlights his “sometimes conservative” record as a congressman 25 years ago along with more progressive leanings on many issues. Espy’s challenge is shared by Democratic Senate candidates in key states such as Missouri and Tennessee. Democrat Hillary Clinton’s loss to Trump in the presidential race laid bare vulnerabilities for Democrats and has party insiders debating the best way to revamp their strategy. In states Clinton unexpectedly lost – including Pennsylvania, Michigan and Wisconsin – she saw lackluster turnout among black voters and a defection of some white working-class voters and union members, who once reliably voted Democratic. Political analysts give Espy a realistic, but difficult, shot to win Mississippi – and it’s the kind of upset the party needs to take control of the Senate from Republicans. Strategists say Democrats’ narrow path to flipping Republicans’ two-seat Senate majority requires capturing swing states such as Nevada and Arizona, and also scoring one or two unexpected victories in states such as Tennessee, Mississippi or Texas. Espy is running in a nonpartisan special election. His main rivals are conservative firebrand Chris McDaniel and establishment Republican Cindy Hyde-Smith. If no one wins a majority on Nov. 6, the top two vote-getters go to a run-off. Espy says he’s modeling his campaign after Democratic Senator Doug Jones, who upset a Republican last year in a special election in Alabama, a demographically similar Southern state. Jones had a unique advantage – his opponent, Roy Moore, faced allegations of past sexual misconduct with teenage girls – but the campaign also effectively boosted African-American turnout. “We have to do what they did in Alabama, which is a data-centric campaign that identifies black voters that haven’t voted in a while and get them registered and get them out to vote,” said Espy, 64. Espy hopes African-American voters will connect with his potential to make history as the first black senator from Mississippi since post-Civil War Reconstruction; his commitment to modern civil rights issues; and his promise to take down the statue of Jefferson Davis – president of the Confederacy during the Civil War – that Mississippi sent to the U.S. Capitol in Washington in 1931. He hopes his record as a former U.S. agriculture secretary attracts rural voters of all races. African-Americans make up 38 percent of Mississippi’s overall population – the highest of any state – giving rise to Espy’s other data-centric focus: He has calculated that, with strong support from black voters, he only needs 25 percent of white voters to win. Even that might be difficult, given that Democratic President Barack Obama won only about 10 percent of white votes here in 2008 and 2012, according to exit polls. Neither is Espy guaranteed strong African-American support and voter turnout. A Reuters/Ipsos national opinion poll suggests black voters are feeling more distant from the party. The percentage identifying as strong or moderate Democrats fell to 61 percent so far this year, down seven points from 2012. Jaribu Hill, an African-American Democrat who heads a Mississippi advocacy organization for low-wage workers, said she was not excited about any of the three main Senate candidates – including Espy – because none had effectively addressed poverty and racism. “People are basically cynical in many ways because they haven’t seen a lot of accountability,” Hill said. While the African-American vote will be important for Democrats in House and Senate races nationwide, it is crucial in Senate campaigns because they are statewide, encompassing more diverse populations, and because most competitive Senate races are in states where Trump trounced Clinton. “We’ve got to not only win the minority vote, we’ve got to excite the minority vote,” said U.S. Representative Emanuel Cleaver, a Missouri Democrat. In Missouri, Cleaver and other prominent African-Americans, including Senator Cory Booker, are campaigning alongside Claire McCaskill, a white Democratic senator seeking re-election. Some black leaders in the state had criticized McCaskill earlier this year, saying she was giving short shrift to African-American voters while focusing mostly on white, rural voters. Since then, she has opened field offices in Kansas City and in Ferguson, the predominantly African-American city near St. Louis that in 2014 erupted in protests over a white police officer’s fatal shooting of a black man. “Claire isn’t taking a single vote for granted,” said McCaskill campaign spokeswoman Meira Bernstein. Steve Phillips, a major Democratic donor and author of the book “Brown is the New White,” says the party wrongly concluded from Trump’s win that it needs to focus on winning back working-class white voters. He argues boosting minority turnout would win more elections. Waikinya Clanton, the Democratic National Committee’s top liaison for black and female voters, said party officials have learned from the failures of 2016 and other cycles that it can’t be seen by minority voters as the party that “just comes around every so often.” She said the party has launched a $10 million fund to find innovative ways to reach out to minority voters. Cedric Buckley, a 48-year-old African-American father and registered Democrat, applauded Espy’s centrist message. “He is the only candidate who is not speaking political party rhetoric,” said Buckley, founder of an early learning center in Jackson. To win, Espy also needs to lure voters such as Shelby Sandifer, a white, 27-year-old behavioral therapist who describes her politics as libertarian. Sandifer, who lives in Florence, Mississippi, said her dislike for Trump might make her more likely to vote in the Senate race – and more likely to vote for Espy, to protest the administration.